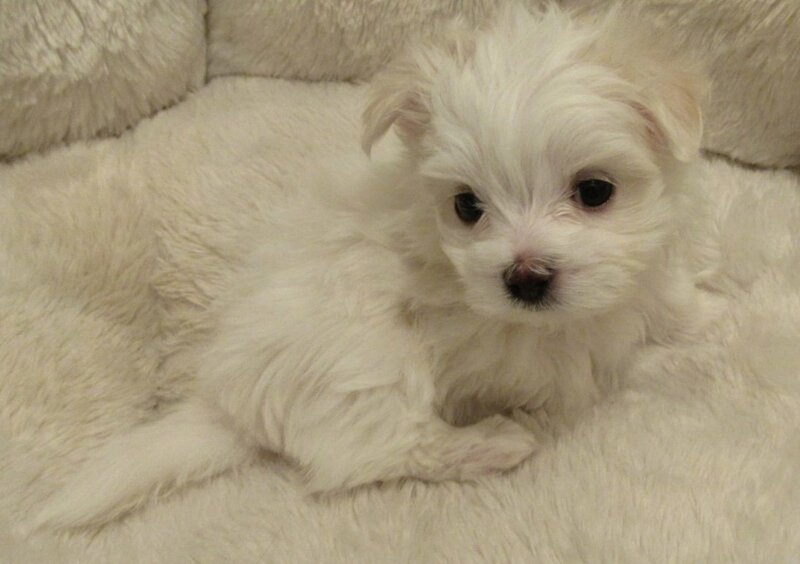 Maltese Angel Babies Blog: Puppy At New Home - Won't Eat - What Can I Do? Before we get into this topic, understand that your baby was eating and drinking on its own at the breeders for at least a week or two for every meal & gaining weight. Otherwise you would not be taking him/her home until he was. Food disruption & refusal to eat is very common after leaving the breeder. Your angel baby has just left its mother and litter mates and the only home he ever knew. He is confused, excited and upset all at once. But one thing is for certain - HE HAS TO EAT and at least 4 times a day! This is what I do when I have a puppy that won't eat for whatever reason. I don't see why it won't work for you if your angel baby won't eat when you take him or her home. So that you have a baseline and know exactly what is going on with your puppy's weight, weigh him/her (in ounces as it's more accurate) when he gets home. Do not allow him to lose weight! This information will help you and your baby get through the 1st week without stress and you will have a well fed happy puppy! Your baby is probably under 2lbs. Missing any meal is critical! They are prone to hypoglycemia which will occur if he doesn't eat on a regular basis. He not only needs food but he needs water. How can you get these in when he won't eat? Do not feed him anything other than the food you were sent home with in order to try and get him/her to eat. Doing that will cause stomach problems and diarrhea which will cause dehydration. This will send you to the vet quickly. These are serious issues for your baby! Be prepared before you bring your puppy home! Have the following things on hand. 2. Have the squeeze bottle ready with ground dog food that was given to you by the breeder. Mix it with warm water so that it is watery and warm on your wrist. I cut a small bit off the top of the squeeze bottle because food particles won't pass through the tiny hole so I make it a little bigger. If you get that problem you need to cut a little off the plastic tip. Not too much or the fluid will overwhelm the puppy with fluid. 3. Sit at a table with a towel under the puppy. Hold the puppy by the hair on the back of its neck to turn its head up looking at you. This does not hurt them if done gently. Put the tip of the squeeze bottle to the side of its mouth (not necessarily in its mouth) and squeeze lightly to express the food mixed fluid. The puppy will lap it up because he's hungry. When he wiggles or stops lapping you stop. Pet the puppy on its head a few seconds and start again. Do this until you think you have fed it about an ounce of fluid. Be sure to burp the puppy on your shoulder during the feeding. Your goal is to feed him 1 ounce of food mixed with fluid (I use bone broth). When you think you're done, weigh him. If you started at 29.3 ounces you are aiming at 30.3 ounces. It's OK if you go a little over as long as the puppy is tolerating it well. You don't want to over feed him. In the meantime, keep the puppy's environment calm and happy. Have a place that is his. Make it a small place not a whole room! Be sure that he has ground food on a small plate, a small bowl of kibble that I gave you and water. 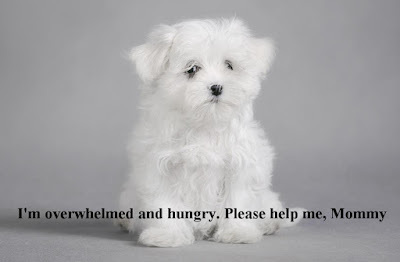 Although you have fed the puppy he will still eat his food usually right after a feeding. They love to chew on the kibble (which is the same food as the ground up food - Wellness). Keep an eye on how much he is eating. Put a little bit of kibble in the bottom of the bowl so that you can tell when he eats some. Always keep him near his food. If he is eating well then only supplement (as mentioned above) three times a day to make sure he is getting enough. Weigh him everyday at the same time. This is how you will know what to do. You want him to gain everyday. You will begin to see a pattern. At first, with you feeding him and him eating he may gain 1 ounce in a day. The next day he may gain 2 ounces. You then know that he is eating on his own so you can drop one of the meals you were feeding him, maybe lunch but not the bedtime meal. If his weight is steady with the decrease of 1 meal, keep up those two meals. Wait till you see that he has gained more than usual which means that he is eating more on his own and then drop the morning meal. Keep a close eye on his weight. When you see that he is eating well and consistently, he isn't crying (a sign that he is hungry) after a week or so you can stop the evening meal before bed. If he wakes up crying, feed him. Wean him slowly. You may need to soak his kibble in bone broth overnight, warm it and offer it on a plate. Soon he will be eating all of his meals without supplementation like he was before you took him home. Remember, the worst thing you can do is change his diet or give him any other food. That WILL cause problems! If you plan to change his food in the future talk to your vet about the best way to proceed. If you have any questions or problems, please don't hesitate to call me. I am always here for you! I've never had any issues with raising puppies in the past but this is great info just in case! Thanks for being so thorough! Thank you Sally, for bring this up. I never realized that would happen with puppies. I never experienced it with my other dogs. This is so interesting and informative. Good to have this on your blog if future problems come up. And its so visual, easy to do. Thank you for so much information. Thank you for the great information! 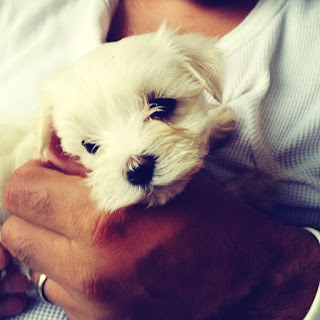 Caring for a puppy truly is like caring for a human baby! Will definitely be bookmarking this specific part for the videos! Again, great information on caring for the new puppies. I love how you always end with "call me if you have any questions". It really reassures me that I have found the perfect breeder. You are so good with these Maltese Angels. Great advice. I like the squeeze bottle information. As I mentioned in a previous blog that I had a bad experience with a Shitz Tuz breeder and I had to take my puppy to the vet several times in the first two weeks for IV therapy because she would not eat. Very expensive and emotionally draining. I love the idea of weighting the babies everyday. This right here I hope does not happen but wow what a comfort it is to have this info available for me to go back to if i do need it. And also knowing that you are a phone call away is honestly something I wish I would of had the first time and even the second time I am sure I will have questions because I definitely do not know everything about this breed. The broth looks like a helpful tool. The squeeze bottle worked well for your puppy. Such wonderful tips on your blog. I can tell you really care about your little ones. The videos are invaluable!—thank you for posting them! I’m hoping I don’t run across this issue but this post will help prepare me to keep my cool, just in case—I’d imagine it would be pretty spooky when your new puppy isn’t eating! This is a big point in our house: not to feed the puppy anything that’s not scheduled or on the approved list. Great advice! Although I have never had a problem raising puppies in the past, this will sure come in handy if I need it. I have already added necessary items to my list of things to have when my Angel Baby comes home. THANK YOU SALLY, AGAIN, FOR SUCH COMPLETE INFORMATION ON HOW TO CARE FOR OUR NEW ANGEL BABY! YOU ARE AMAZING!! Also, the videos are such a help and take the apprehension away in case we need to apply this specific care to our puppy! I have had to use those bottles for water and meds while nursing a sick puppy, but never had to use to fed one. What a great clue to pass along. I feel like you have prepared your parents for anything, and then of course you are just a phone call away! Good information. I don't think I have ever taken a baby away from his mother before. I have always gotten the puppies after Mom was gone. I need to prepare for the stress of taking her from mom.